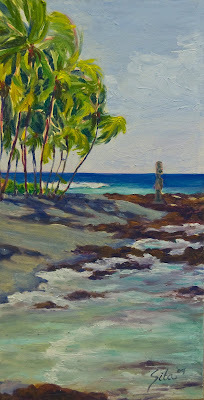 Artist's Comments: Along the shoreline of Kona village stand two impressive tiki gods protecting the Resort from both the Northern and Western corners. Carved out of large tree trunks, homage is paid to these gods by draping flower leis across their shoulders. The Kona Village Bay consists of a black sand beach with sections where there is a reef entry and soft sand entry. The reef entry creates wonderful purple shadows as the rocks dip just below the surface and collect small waves headed for shore. They gently lap the shoreline creating a serenade for guests who are lucky to inhabit the few oceanfront bungalows.